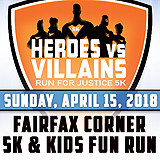 Come join the battle for the HEROES vs. VILLAINS 9th Annual Run for Justice 5k benefitting the Fairfax Law Foundation. Join us on Sunday, April 15, 2018 at 9:00 a.m. ready to run in your favorite superhero or villain costume. Prizes awarded to top finishers and best costumes – individuals, duos and groups. Register in person or pick-up your packet Saturday, April 14th at the Potomac River Running store located in the Fairfax Corner Shopping Center, from 11:00 AM-3:00 PM. Race day registration and packet pick-up will open at 7:30 a.m. and will take place at the Pavilion in the center of Fairfax Corner Shopping Center. Scorpio Entertainment will provide pre and post-race music and eMotion Dance Fit will provide a pre-race warm-up. Carrying on the tradition of previous races, 2018 will feature pre-race coffee and doughnuts and a plentiful post-race buffet. This race will be timed by Commonwealth Race Management and will be electronically timed using the ChronoTrack B disposable tag system. Overall awards will be based on the "clock time," and age group awards will be based on "chip time." Join in the fun as an event volunteer! This event relies on 50+ volunteers to be successful and we need YOUR help. Volunteer jobs include water station, race buffet registration area, or course marshals on race day. We will also need volunteers at packet pick up. Please contact Mary Huff at mhuff@delaneymckinney.com for more information or to volunteer. Sponsorship opportunities are still available. Please contact Josh Isaacs at jbisaacs@smolenplevy.com or Courtnie Norris at cnorris@fairfaxbar.org for more information. Follow us on Twitter - run4justiceFLF.